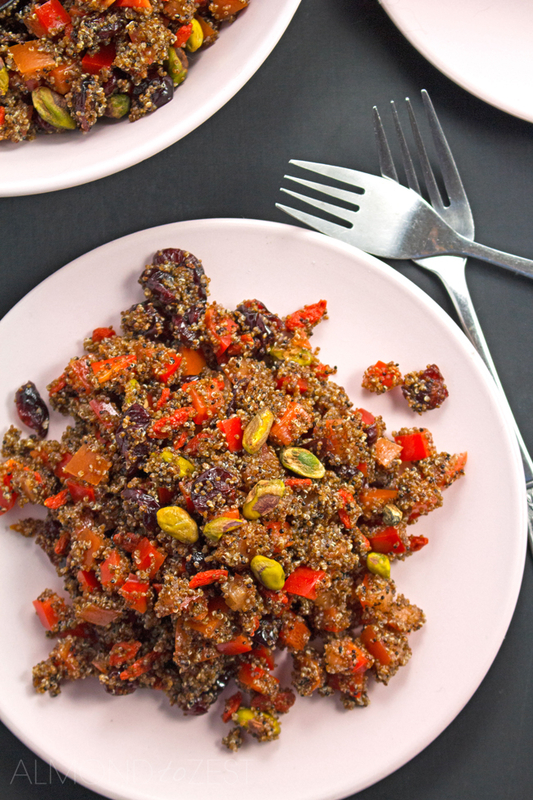 This goji berry and kaniwa salad is a great option for vegetarians as it is loaded with protein and iron. It can also easily be made vegan by substituting the honey for another sweetener! With a combination of dried berries, nuts, crisp red vegetables, crunchy kaniwa and a sweet citrus dressing, this healthy almost raw red salad is a must try. So this salad was one of those ‘let’s try it’ kinda recipes, where I had not really thought of putting these ingredients or flavors together before… but was so grateful that I did, because what happened was something amazing, something unexpected, something that I will return to again and again. A salad was created, that had amazing flavors with exceptional textures and incredible health benefits. All wins in my book!! Everything in this salad is small sized, which works cause you can get all those flavors and textures into every mouthful. Small dices of raw red bell peppers and tomato are added into a bed of crunchy red kaniwa. 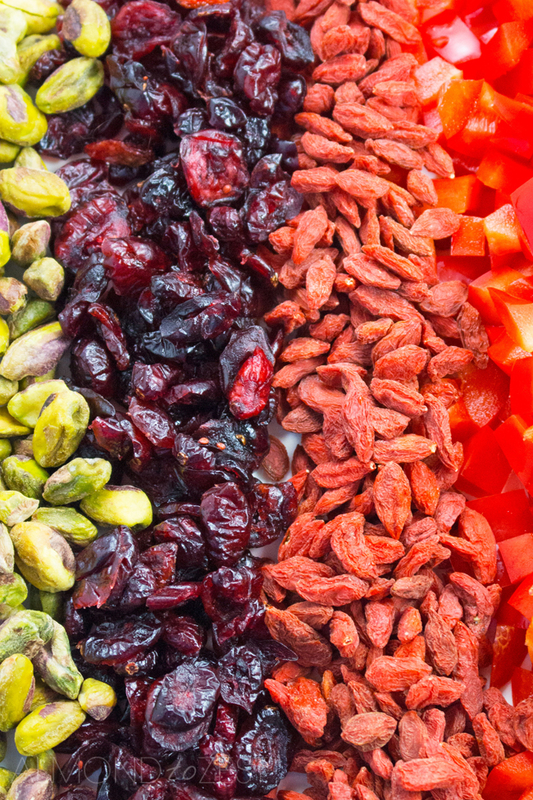 Sprinkled with dried goji berries, dried cranberries and shelled pistachios then tossed together with my honey infused orange vinaigrette. Now like I mentioned before this salad contains some pretty healthy ingredients in it, that have an impressive list of health benefits, one of them being the amazing goji berry. These berries are a nutritional powerhouse and contain natural anti-inflammatory, anti-bacterial and anti-fungal abilities. They are loaded with vitamin C, calcium, zinc and many more important minerals. Plus they have 15 times more iron than spinach and they have the highest concentration of protein out of all the fruits in this world. That is some serious goodness for such a little berry. 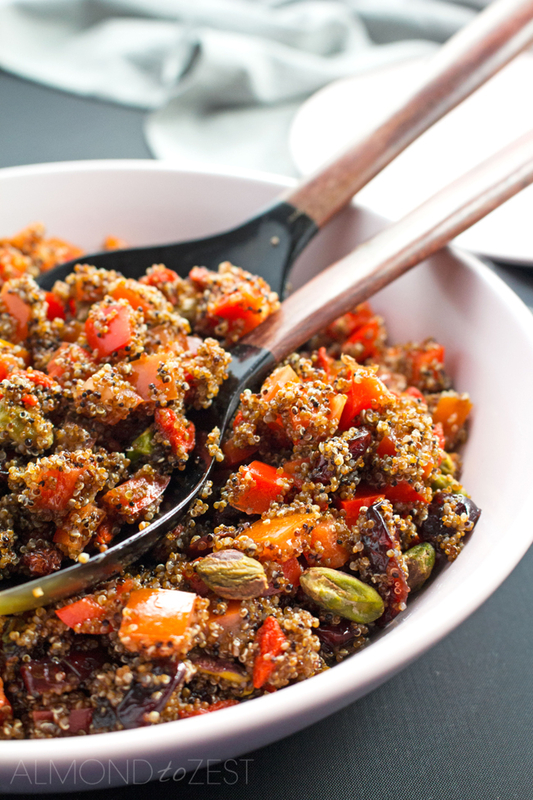 The other super food ingredient in this salad is kaniwa which is a close relative of quinoa and is some referred to as ‘baby quinoa’. 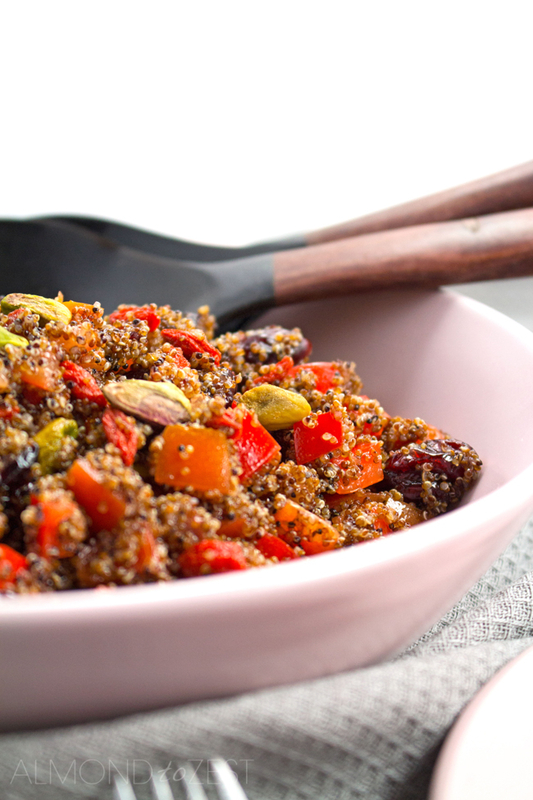 Even though this tiny reddish brown seed is only half the size of quinoa it contains 4 times as much iron, giving you 60% of your recommended daily intake in a single serve. It also high in protein and contains all 9 amino acids. Plus by eating it you will boost your daily intake of calcium, zinc, omega 3, 6 and 9 as well as increasing your levels of antioxidants. Kaniwa is super easy to cook and you can use our easy 3-step guide on The Best Way To Cook Kaniwa here. This incredibly power packed salad is naturally gluten-free, dairy-free and is a great option for vegetarians due to the amazing amount of iron and protein contained with in it. It can also be made for vegans by replacing the honey for another kind of sweetener. So get your health kick on and try this today. Remove the stem, pith and seeds from the bell pepper and finely dice. Remove the seed from the tomato and finely dice also. Take a large mixing bowl. Place the cooked kaniwa, diced bell pepper, diced tomato, goji berries, cranberries and pistachio in side and give a good mix. To prepare the citrus vinaigrette place the cider vinegar, Dijon mustard, honey and orange juice in a small mixing bowl and whisk together until combined. Slowly add the olive oil and whisk quickly until combined. Pour the citrus vinaigrette into the salad, mix well and serve.